Scrap This, Save That: Birthday Month Giveaway! Happy October! And happy birthday month to me!!!!! Last year when I was a lot newer to the fabulous world of BLOG, I did an "Un-Birthday Giveaway" near my big day. Now, I've learned from so many of you that birthdays shouldn't be restricted to just a single day, or passed over entirely...they should be celebrated the WHOLE month!! And I figure that I'm getting old enough, I should really get all the celebrating in that I possibly can! Life's to short to ignore it! So grab a birthday hat and a margarita (or a soda!) and come celebrate with me! 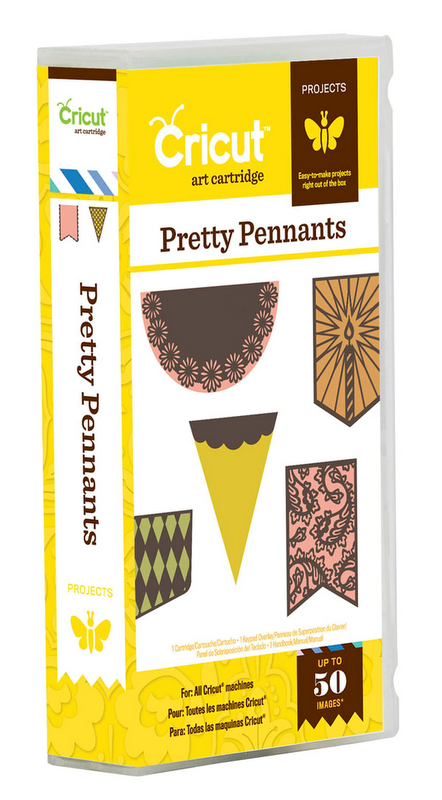 I'm giving away the Pretty Pennants Cricut Cartridge to one of you lucky readers!! Although my birthday is on the 21st, this giveaway will stay open for the entire month. You have lots of different ways to earn entries! Several of them, you can do daily. Mr Rafflecopter, below, will tell you all about it! Who else has a birthday this month??? Let's PARTY!!!! Oh, and PS...this giveaway is open worldwide. Although I understand why, I just hate restricting giveaways, so I've been trying to find easy and light-to-mail things to give away these days! well Happy Birthday Month!! Thanks for the chance to win! My favourite thing about Autumn is playing in the leaves with the kids! Happy Birthday to you my dear blogger friend. Hope your October is fun, Kookie & a little spooky (in a good way)!!! I guess my favorite things about fall would be.... the changing of the colors in natures background. I think the colors of gold, burgundy's and the many hues of orange and deep plum in the tree lines are my most favorite. The smells of the comfort foods cooking up in the kitchen and all the soon to be festivities with family and friends. I could list many more but I better leave room for others to comment. Thanks for stopping by and leaving me a sweet note regarding my coffins the other day. They were so much fun to make. Happily Crafting & Scrapbooking My Memories~Sandra V.
happy birthday! My fav thing about Autumn is .. EVERYTHING.. I love the smells, the rain, the cold, Halloween, Thanksgiving, the colors, the sound of leaves crunching under your feet, spiderwebs in the frost/mist. love it all!! :D thanks for the giveaway! Happy Birthday to you and many more!! Happy Birthday Month! My favorite thing about autumn is the colors. Such a pretty time of year. Happy Birthday to you! How sweet of you to give a gift for YOUR birthday! I like the idea of grabbing a margarita ( you should stop by my blog and see why!!). I love autumn, I love the colors and decorating my home with pumpkins, leaves and acorns. I love seeing the trees turn color and the beautiful mums and the pumpkins!! Thanks for having an awesome giveaway!! How cool is that to have your birthday all month long!! I think I will do that next month! I am a new follower and found you through Kristan over at Baby Cakes!! I look forward to seeing your projects... Happy Birthday month!!! My favorite thing about Autumn is the smell of damp leaves while taking a walk in the woods...just love it!!!! Thank you for the chance to win this awesome cartridge!!!!! Somebody is destined for a real treat with this! How fabulous and generous of you. Happy Birthday for the 21st, I hope you get spoilt rotten!! I was standing in my kitchen looking at the sun coming up over the trees this morning. There was a slight mist and the leaves were golden and red and I thought "Autumn is definitely here". There's a look, a smell and a bite in the air that only Autumn has. I love it! Great giveaway, Amy! Love my cricut and would love a new cartridge, too! Okay, now I see the question. My favorite thing about autumn is the cooler weather. I love sweaters and wearing my hair down and boots. Love it! Happy birthday to my sweet bloogie friend! I hope everyday of this month you celebrate! My fav part of fall has to be the colors. The leaves change to beautiful reds, orange, yellow. The air is so crisp and fresh! I love the crisp fresh air and the colors!! Thanks for visiting and for you kind words on my blog!!! I actually had seen this giveaway already (I'm a follower!) but then got distracted by something and never got around to entering - so thanks for the reminder! My favorite thing about Autumn is all the beautiful colors...and the excuse for comfort food like soup and bread and baked goods (YUMMM..) I guess that was two things, but I couldn't choose! And happy birthday month to you!!! Happy, Happy Birthday to you. I totally agree with you enjoing each and everyday. Happy Birthday! I love the changing colors of autumn but I also love decorating for fall! Hello lovely lady!What a giveaway! !I have just got off You Tube, looking up all the banner / pennant ideas I can find. Hope you had a lovely birthday. I am a new volunteer at a museum, and making pennants and other crafty things for their craft shop. I adore Autumn as the slightly melancholic feel echoes the gentle changes that reflect in a person's life.Each season has a particular mood. I hope when you celebrate your big day its awesome! I did a birthday bash this year myself and it was fun! Thanks! Happy Birthday!!! Both my dad and brother have October birthdays. My mom's was also in October, bless her heart -- so that made me the only oddball of the family (June). What do I love about autumn? The colors. Check out my post about La Veta Pass. The aspens are just gorgeous. Happy Early Birthday. What a great blog candy. Hope you have a blessed year. My favorite thing about Autumn is the beautiful colors. This is a very generous giveaway you are having for your birthday. Have you ever used this cricut cartridge before - I was wondering what you thought of it... I'm so into pennants (we call bunting in the UK) so I bet this will produce some stunning variations. I love football and pumpkin pie. I live in Wisconsin and the leaves this year were amazing. Happy Birthday. Just found your blog from Stacy H's site. What I most love about Autumn is the color and smell of the leaves. Have a super Birthday month. Just realized the month is coming to an end. Just found your blog and would love to have your craft desk.